The Pinball Blog. The Machines. The People. The Events. The Addiction! Pinball Heroes: Industry Interviews. Click the number to join them! Steve Ritchie gave me a silver-plated pinball badge. Given to him by the president of Williams! There aren't many guys who still design pinball machines in the 21st century, but The Pinball Blog tracked down John Borg who can make that claim. The Pinball Blog. So you're John Borg, one of the only people on the planet who can still claim to be a pinball designer! What are your current responsibilities at Stern and who else does what? John Borg. I am wearing a lot of hats these days as are many of the small staff at Stern. I am designing and a mechanical engineer, working with artists on concepts and content, Designing game rules with software, Creating the game manual with service and parts sale departments. I work with purchasing and production and building prototypes (whitewood game). I also put out fires. Gary Stern and Marc Schoenberg are handling our licensing contacts. Kevin O'Connor and John Youssi are creating art packages. Mark Galvez is producing Dot Matrix art. Lonnie Ropp and Lyman Sheets are the software engineers. John Rothermel and Robert Blakeman are the mechanical engineers. Patrick Powers and Dorothy Brown are Service and Part Sales. 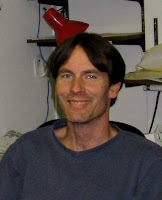 Sheridan Oursler is producing our Bill of Materials, Cable design and handles all of our Engineering prototype orders and change notices. He is a Jack of all trades. Ed Spears runs purchasing and Don Thorn runs Production. We are certainly a smaller group than we were last. I am just about to prototype a game that is two games ahead of 24. I am gaining ground and trying to get ahead in order to give software as much time as possible on future product. 24 turned out to be a very nice game and is being well received. The two games that will follow 24 will be awesome as well. TPB. From all the machines you've been involved with, which are you most proud of? Commercial success, or personal favourite or innovation. JB. This is a tough question Nick. I would have to say Data East Star Wars which was my first game. Indiana Jones which was my first game since I returned to Stern in 2007. My Frankenstein monster on Mary Shelley's Frankenstein game, the Moon and Rocket assemblies I designed for Apollo 13. Also have to add the Electro magnetic spinning Disc I designed for the Twister game and the door handle shooter on Tales from the Crypt. TPB. You like your ramp shots on pinball machines, is this anything to do with your passion for BMX bikes? Do you still ride? JB. Ramps and BMX - Bmx was a part of my life that ended in the early 80's. I started again in 2006. It was a mid life crisis thing. When I started again I never thought I would be getting 5-6 feet in the air again at my age but I have. What a rush !!!! As far as pinball ramps go, I like smooth long shots with smooth curves and a soft landing. Bmx ramps are sharp and abrupt and the landing is not very soft. The similarity between the two is they are both gratifying. TPB. 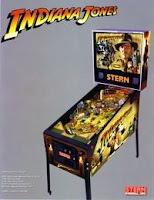 How difficult is it to work on a license like Indiana Jones when the theme has already been produced with much success as a pinball machine and the two will always be compared. JB. I had a great time working on Indy Jones. I didn't have the budget or the timeframe that they had at Williams back in the day. 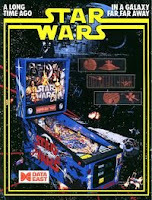 However we did make a really nice playing game with a great multiball introduction and some of the best Dot Matrix work I have ever seen on a pinball game. The Arc of the Covenant is a really cool pinball toy. TPB. A little birdie tells me you were working on Transformers as a pinball license for around 6 weeks before this was put on hold to concentrate on Indiana Jones. Is that the nature of the industry or is it a major frustration? How far had you got and is it likely to ever be finished? JB. I wasn't working on Transformers. I was working on a rock and roll game themed on the best rock and roll band of all time. Unfortunately the license didn't go through. I was devastated and lost two months of work. I was really glad to get the Indiana Jones theme but still had to have a game ready for the same time slot. TPB. When Ray Tanzer left Stern, you came in to run engineering and were given the schedule of the next 6 titles. I understand those 6 machines have since changed. Are you able to give us an exclusive on what's coming up from Stern Pinball? JB. We didn't have a schedule of 6 titles at the time. NBA will follow 24 and a very cool theme follows NBA. We are looking at several titles for next year. I'm really pushing for Munsters. I miss Ray, Steve, George, Pat, Keith and Dwight. Maybe when the economy comes back some of the guys might come back. Hopefully before I'm in a rubber room in a straight jacket. TPB. You designed Guns n' Roses and Slash also has a design credit. How much involvement did he really have with the design, did you get to meet him and did you party/jam with him? JB. 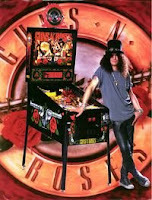 Yes Slash had design input on the GnR game. Joe Kamikow asked Slash to dig up an unreleased GnR song to put in the game. That was really cool and a nice touch. I visited Slash in LA and he came out to visit us a couple times. I still have the Jack Daniels bottle. We had a great time with him. When I visited him in California his 6 month old cougar Curtis pinned me and had his mouth around my neck. Never pet a cougar on his belly !!!!! I just layed there calmly until he was finished playing with me. I figured if he bit down hard it would have been over quickly. TPB. 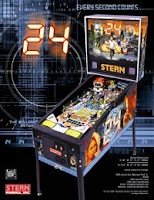 Steve Ritchie may have moved on from pinball but I hear he was designing a game to follow 24, is it something that is likely to be finished and if not, (or even if so) can you tell us what it was? JB. Steve started a layout for a game. I'm not sure if the license is secured yet or if it will be produced or not. Can't say what it is at this time. TPB. How much time/money is spent on a machine like Richie Rich as a one-off movie prop and do you know where the machine is today (I believe it was given to someone at Stern, but subsequently sold)? JB. Well the playfield was a Lethal Weapon III. The artwork had to be produced and screens needed to be made. A few weeks of Dot Martix work, sound and programming. A custom game would not come cheap. I remember we made a few games for Aaron Spelling. We had a special artist come in and decorate the cabinets. He painted them to look like marble that matched the marble in Mr. Spelling's home. These games were a present from his wife. TPB. Finally, I always ask our Pinball Heroes to sum up their involvement in pinball in one word or sentence. Many thanks to John Borg for taking the time to answer our questions and for his great answers. If you would like to see YOUR Pinball Hero interviewed drop us a line and we'll try and make it happen! More Pinball Heroes coming soon. Great interview per usual Nick. Maybe Stern should hire Slash to help design a pin with Borg. GNR was Borg's best game ever. but Borgie was my favorite. I need to get out more, and sending me email really doesn't help! Super the Hardest: Ep108-Who Got the Booch?